I have wanted to make this cake for quite a long time but could just never find the time or an occasion. To be honest, it probably wasn't even a fancy enough occasion for this cake, I should have just had it as a flat-warming cake! But everyone still enjoyed it and I did finally get to make it! I altered the recipe quite a lot though, because the cake is supposed to be quite small but tall, so I used bigger cake tins with only 2 layers. You couldn't really taste the caramel that much, so if I made it again, I would probably double the cake recipe and keep the frosting recipes as they are. 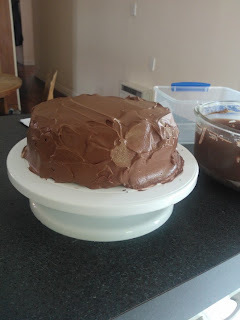 So this recipe as it stands would make a double layer 20cm cake or a 15cm triple layer cake, but with a tonne of chocolate frosting left over from a 20cm cake. So I would either halve the chocolate frosting or double the cake recipe, and the amount of salted caramel buttercream would be enough. It still tasted great and I would definitely make it again sometime. We did have a ridiculous amount of frosting left over however, and the tops of the cakes I cut off, so I broke them up and called it cake pieces and dip for our party that night! :) The recipe comes from Sweetapolita. Preheat oven to 180°C. Prepare three 15cm round cake tins or two 20cm round cake tins with butter, parchment paper rounds and cocoa powder. Tap out excess. In bowl of electric mixer, sift all dry ingredients and add all remaining ingredients to bowl with the dry ingredients and with paddle attachment on mixer, mix for 2 minutes on medium speed (you may need the plastic splash-guard that comes with mixer, or just put your arm around the top) and pour into prepared pans. If possible, use a digital kitchen scale and weigh divided batter in pans for even layers. Batter will be liquidy. Bake for 20 minutes and rotate pans in oven. Cakes are done when toothpick or skewer comes clean–approximately 30 minutes. Try not to over bake. Cool on wire racks for 20 minutes, then loosen edges with a small palette knife and gently invert onto racks until completely cool. Trim any doming from the tops of your cake layers with a sharp, serrated knife and place first layer, face up, on your cake board, pedestal, or plate. Using a small offset palette knife, spread approximately 3/4 cup of the caramel buttercream evenly on the top. Repeat this 1-2 until you come to the final layer, which you will place face down on the top of the cake. Place cake on a turntable (if possible), and using a small offset palette knife for the top of the cake, and medium straight palette knife for the sides, cover the cake in a thin layer of chocolate frosting to crumb coat (seal in crumbs). Refrigerate for 30 minutes (or more). Repeat step 4, and, for best results, use bench scraper held at 90° against the side of the cake, slowly turning the turntable and keeping your hand steady–let the turntable do the work. Clean up edges with your small offset palette knife. Chill cake to set. Bring to room temperature before serving–about 2+ hours. Sprinkle with Fleur de Sel. The first step is making the salted caramel (you can also do a non-salted caramel by omitting the sea salt), to set aside to cool while you make the swiss meringue buttercream. You then add the cooled caramel sauce to the buttercream as the very last step. Place 1/2 cup + 2 tablespoons of the sugar and the water in a medium saucepan to a boil over medium heat. Brush down the sides of the pot with a dampened pastry brush to prevent sugar crystals from forming. Stop stirring and cook until caramel is dark amber, gently swirling from time to time. Remove from heat, and slowly add cream, whisking by hand until smooth. It will be splatter and bubble, so be careful. Whisk in sea salt and vanilla. Let cool. Place butter in an electric mixer fitted with the paddle attachment and beat on medium speed, until pale and fluffy, about 3-5 minutes. Transfer to a large bowl and set aside. Wipe the bowl of an electric mixer clean with lemon juice, and place egg whites and remaining sugar into bowl over a pot of simmering water (not boiling–you don’t want to cook the eggs). Whisk occasionally and gently until sugar dissolves and mixture registers 160° on a candy thermometer. Remove the bowl from heat, and place back onto the mixer fitted with the whisk attachment. Whisk on medium speed for 5 minutes. Increase speed to medium-high, and whisk until stiff, glossy peaks form (about 5-6 minutes). Once the bottom of the bowl is neutral and no longer warm to the touch, reduce speed to medium-low, and add beaten butter, one cup at a time, whisking well after each addition. Switch to paddle attachment. With mixer on low speed, add cooled caramel, and beat until smooth (about 3-5 minutes). Combine cocoa powder and the boiling water in a small bowl or glass measuring cup, and stir until cocoa has dissolved. In an electric mixer fitted with the paddle attachment, beat the butter, the icing sugar, and salt on medium-high speed until it is pale and fluffy–about 5 minutes. Reduce mixer speed to low, and add melted chocolate (cooled), beating until combined and scraping down the sides of the bowl as needed. Beat in the cocoa mixture until well incorporated.